Vashti's Crochet Newsletter: Fun Yarn Tests, and - BIG NEWS! Thanks so much for subscribing! You're reading issue #55. How do you go about getting to know a new yarn? I've been noticing how I do it because I've just added my first original yarn to the DesigningVashti shop! Please see lower right column for more on the yarn, and for a subscriber-only coupon. Back when I designed for other yarn companies, the specific yarn, color, project, or all three were chosen for me. This determined how the I got to know the yarn. Doris and I created a dream yarn together called Lotus. It's unique, so we can't just rely on our experiences designing with other yarns. It's z-twisted and has 12 plies with a sleek way of blending cotton and rayon. Lotus is a newborn and can be anything she wants to be, so how do I find out about her hopes and wishes? 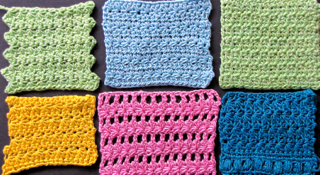 Over the years I've kept a list of crochet stitch types in my head. Do you do this too? I group some stitches together by their effects on yarns. Certain textures and stitch structures bring out something new in a yarn. They can make a yarn confide its innermost dreams! 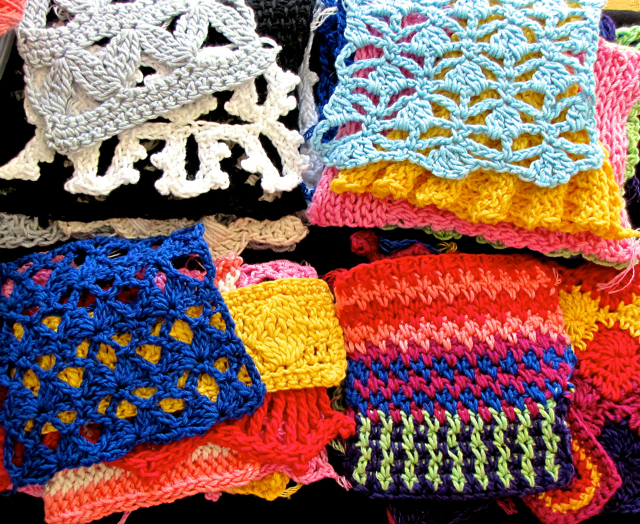 It's an amazing aspect of crochet. A fancy stitch might look elegant in one yarn yet chaotic or lost in another. It might drape, gape open, lump up, or settle into a dense lacquered finish. I always do some Tunisian Simple Stitch (Tss) because of its unique woven look. Then I try some lacy types (wicker mesh, filet style, and extended stitches. 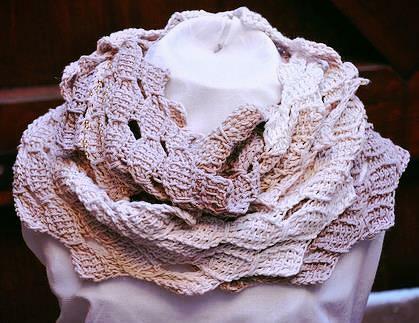 The lacy 3-color Petals cowl (shown above left) is based on Tss, and tests this color combo of Lotus. 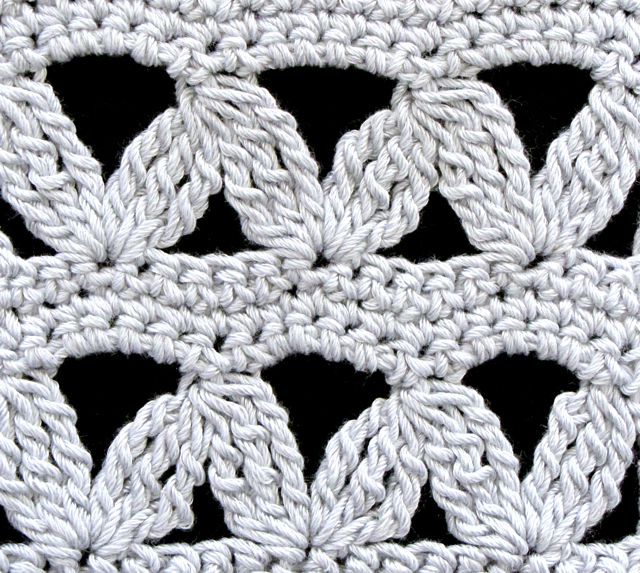 See right column about a CAL (Crochet-Along) for this design. Love Knots/Solomon's Knots bring out a different side of any yarn. For me, they stand in for other pulled loop types like Broomstick & Hairpin laces too. I look at how the knotted parts look and if they stay knotted; and how big the love knot "balloon" can get before it collapses into a languid oblong shape instead. 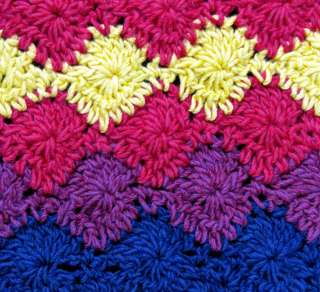 Long-legged stitches or "stretched" stitches, like spikes, puffs, and star stitches, can really get a yarn chatting! (See issue #50 on crochet 'feet.') Photo at left shows six different star stitch patterns. Picots. Have you ever noticed that picots bend and snuggle differently, depending on the yarn or fiber? And the yarn's sheen changes their look? 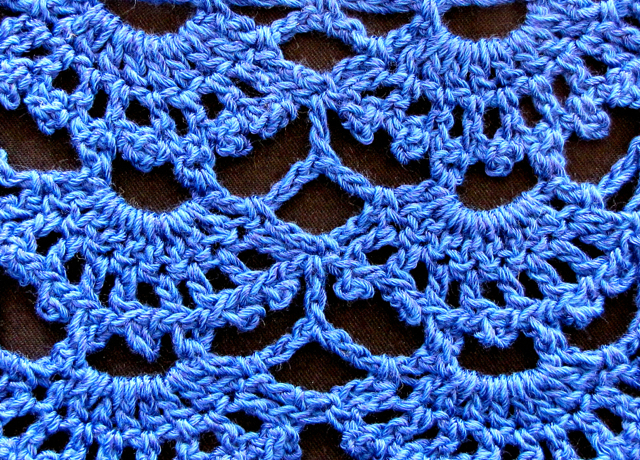 I usually swatch the classic "Picot Fans" stitch pattern because I can see shells as well as picots. I want to see how the yarn looks when it fans out, and how the shells stretch, drape, and expand. A few color combos: My go-to stitch patterns for 2+ colors are "Catherine's Wheel"(shown at left) and "Seed Stitch." I think for some people it's ripples, or granny squares. For me, super tall stitches are my "deal breakers." I think of any crochet stitch taller than a treble as the test of whether a yarn is special, not just nice. Lotus had to pass this test, or I would have passed on Lotus. 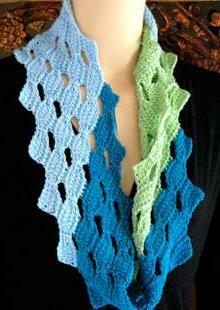 I turn to my favorite tall stitch pattern, "Triple Treble Shells." (Link goes to Dessert Party Apron; a variation was also used for the Tokyo Jacket sleeves, a free pattern.) I want to enjoy crocheting them, love the look of them, and be able to whip up my crocheting speed with them. "Tall" order, right? 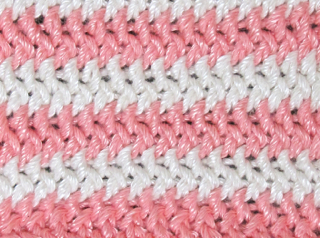 I wonder if every long-term crocheter has her/his own ultimate testing stitch. For Doris I think it's shells in relaxed gauges. Doris is elated about how Lotus passed her shell tests! ...Add water to it (i.e. block a swatch). Lotus is one of those yarns I described in issue #26 that noticeably relaxes, even when just spritzed. 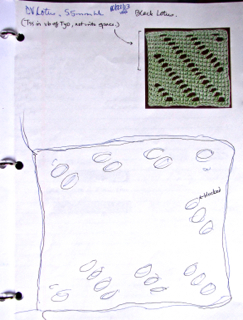 (At left a swatch was traced on a swatch page before and after blocking in two inks to show changes.) The sheen of it also glows more, and plumps the stitches a bit into pearls. 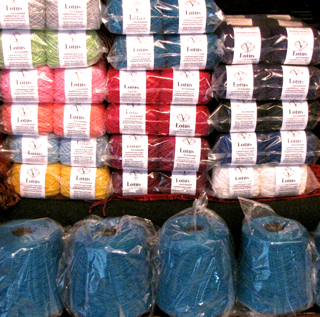 ...Try several colors of the yarn - because colors bring their own stories to the conversation. ...Photograph it and view it online, for perspective (link goes to Flickr photo set of yarn tests). Style wise, a complete yarn story answers: Can this yarn go hippie boho? Daytime casual with jeans? Holiday parties? Lingerie chic (see photo, top right corner)? Vintage Riviera? And, reveals hidden talents: for example, it turns out Lotus also wants to be pretty spa cloths, tea towels, and other pampering things, because it's cheerfully absorbent. 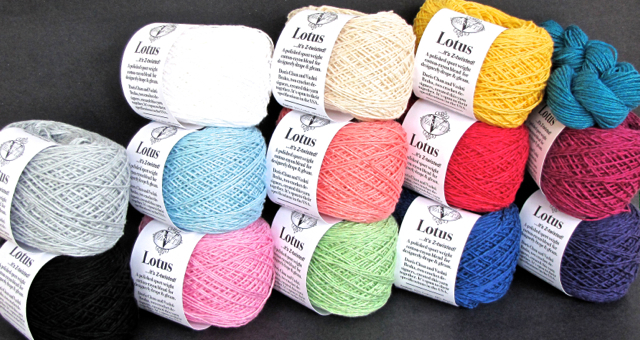 ANNOUNCING LOTUS: The First Ever DesigningVashti Yarn! The birth certificate for this Z-twisted rebel says Lotus is a sport weight blend of cotton and rayon, made in the USA. Click this exclusive coupon to get FREE SHIPPING until Dec. 9, 2013. 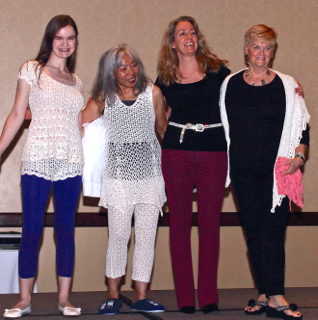 Doris Chan's Jolimar Skirt, crocheted in purple Lotus yarn! isn't it gorgeous? It's a free pattern (click photo); original yarn is discontinued. Please see my guest article about the 1905 beginnings of yarns like Lotus over at Gwen Blakley Kinsler's Royal Ramblings blog. It includes the research I did on antique love knots for a class I taught at the CGOA conference in October. Crochet Alongs in Vashti's Forum: 1. A Crochet Jewelry CAL is currently going on. Littleberry inspired my 3-color Lotus Petals Cowl over in the left column! I'm deciding whether to seam mine or make it long enough to wind it twice like Littleberry did hers. - My Pinterest Crochet Boards! I have almost 10,000 pins on over 90 boards. Recently created a new board just for star stitches. Newest board is for Lotus. - Our forums! Doris' Ravelry forum. My Ravelry forum. Our moderators are awesome! - This newsletter's Facebook page! 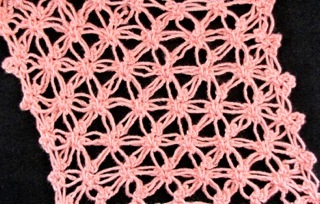 Kim Guzman's new Tunisian crochet video shows how to do what I call the "hook 'n flick it" maneuver for twisted Tunisian stitches: http://youtu.be/F8nEMD_sG8o It's faster and more fun, especially in my lace classes. URGENT: If your email inbox now has tabs, like Gmail, drag this newsletter to the tab you use so that you don't miss an issue! 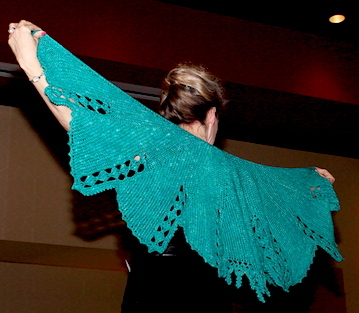 Raveler Dunnica (Joyce Lewis) won the 2013 DesigningVashti prize for Technical Excellence for her Tunisian "Dragon Wings" shawl. Congratulations Joyce! You received this email because you opted in at my DesigningVashti website. Unsubscribe <<Email Address>> from this list. Copyright (C) 2013 DesigningVashti Crochet All rights reserved. every other Thursday (except when she's designing classes! ).